A young girl tries out different genres and instruments in this exuberant celebration of music, winner of the Coretta Scott King New Talent Award--now available in a special anniversary edition. This is my family. We all love music, begins a young percussionist. When she plays with her father, a cellist, she taps the triangle. With her sister's marching band, she crashes cymbals together. At her aunt's jazz show, she taps a woodblock. 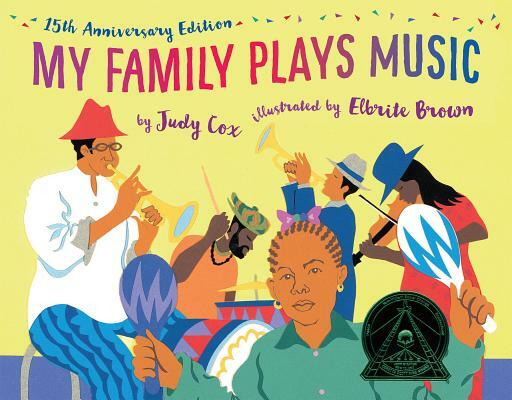 Elbrite Brown's lively cut-paper illustrations, for which he was awarded the Coretta Scott King New Talent Award, depict this diverse, joyous family dancing, strumming, drumming and fiddling their way through a tour of major musical styles--everything from classical string quartets, to rock and roll, to the youngest niece banging on pots and pans. They love music--and most of all, they love to celebrate and play it together. Includes a glossary covering types of music and instruments mentioned. Judy Cox is a musician, former elementary school teacher, and the author of picture books such as Sheep Won't Sleep. Her chapter books including Ukelele Hayley, a Bank Street College Best Book, and The Secret Chicken Society, which was nominated for four state awards and named a Best of the Best title by the Chicago Public Library. She lives in Oregon. Elbrite Brown is an art teacher, fine artist, and children's book illustrator. Raised in Philadelphia, he has fond memories of his mother drawing little pictures to help him associate letters with images as she taught him the alphabet. He was awarded the 2004 Coretta Scott King/John Steptoe New Talent Illustrator Award.